Crimini Sliders ~ I Can Do That! Yes, it's that time of the month again, i.e. my regular craving for vegetarian fare. I wanted something barbecue-y and brown crimini mushrooms, also called baby portobella, are the perfect substitute for beef because they have a smokey meaty flavor. I cooked them in a skillet with a tablespoon of water, added KFC bottled barbecue sauce, then I filled the cavities of the mushrooms with grated Gouda, topped with sauteed onions and served in 2½-inch mini burger buns. 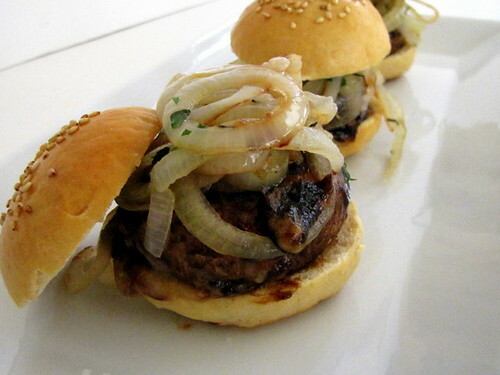 These are very good barbecue mushroom sliders. For regular size buns, you can use the very large portobellas. And for added smokey flavor, cook then on the grill. In a skillet, heat the olive oil and saute onions and salt until onions are translucent. Add the herbs and stir fry for 2 minutes. Set aside and keep warm. In the same skillet, simmer, covered, the mushrooms with 1 tablespoon water until tender, about 10 minutes. Add the barbecue sauce and stir until the mushrooms are fully coated with the sauce. Turn the mushrooms and fill the cavities with enough Gouda, flip the mushrooms and cook until the cheese has melted. 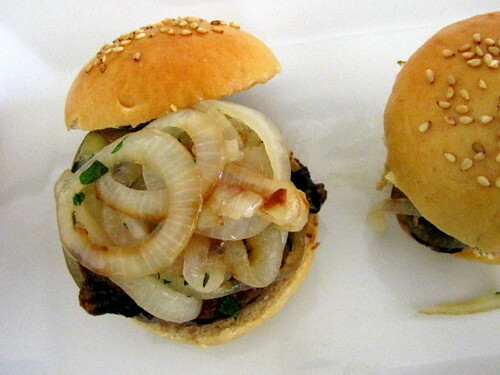 Put one mushroom on the bottom half of each mini bun, and top with onions and cover with the top half of the bun. Enjoy! The white bread recipe is here. To make mini burger buns, scale 1 - 1½ ounces of dough. Brush the risen buns with egg wash and top with sesame or poppy seeds just before baking. That looks great. I alway use mushroom as an subsitute for meat. I wonder if I could trick my husband with this. I think I could. Yummie, love the sliders with the mushrooms...they sure look so appetizing. Nice pictures.